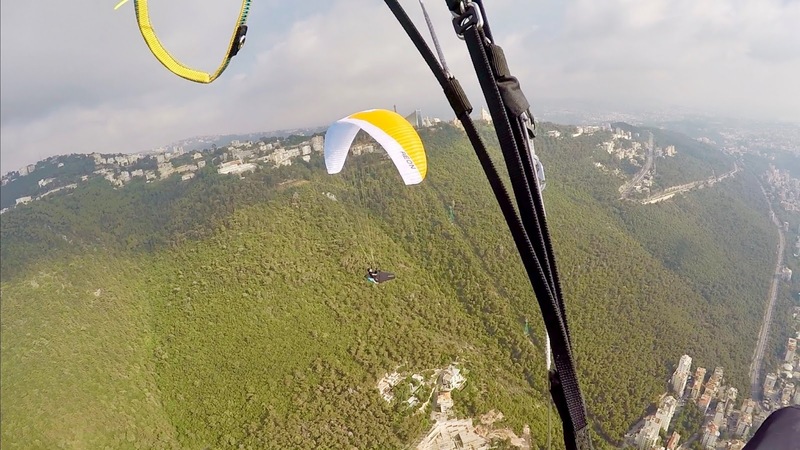 The Aeon is the new EN-D from Sky-paragliders with a D rating. It has a 7 aspect ratio and three lines configuration. The launching is homogenous and easy. It resembles the LM6 launching behavior. 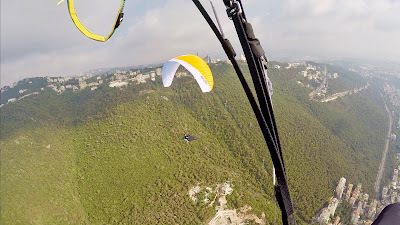 In the air at 93 all up, the brake travel to induce a turn are relatively moderate to short and the reaction of the glider in homogenous but strong thermals is quite nice and the Aeon could be described as fairly agile. In turbulent air and choppy thermals, an implication is needed to make a clean turn as i could sense the aspect ratio. Much like the LM6 in that matter. The difference is that the LM6 brake are slightly firmer and it feels more as a block, the Aeon feels quite tamer, slightly less feel on the brakes, and less dynamic movements in overall conditions. The trim speed of the Aeon M at 93 is around +1.5 km/h than an LM6 S (70-85) at 85 all up or an LM6 MS at 95 all up. The glide in still air is very close. The glide in turbulent air is also quite similar. The difference came slightly at first bar in turbulent air where the Aeon comfortable movements could have a slightly floatier results. But it’s really very small…And practically the differences will come from the pilot in that case. The C controls work well on this 3 liner. For sure not comparable with 2 liners but still nice to prevent moderate pitch behavior in turbulence. However, i was impressed by the climb rate of the Aeon that showed me on several occasions a slightly faster climb than the LM6, especially in sudden thermals or strong cores. It seems that the Aeon is converting every move to a climb which gives a quite efficient tool in XC. This was also felt in moving air where the Aeon could be a nice efficient floater in those conditions, surfing the airmass rather than bumping and loosing the glide. Actually the 7 aspect ratio Aeon was giving me a D class performance which is different than a high C class performance glider in it’s ability to convert the turbulent air into good and smooth gliding properties. The differences in behavior between the LM6 and the Aeon are very different, as one pilot will appreciate the stiffer feel of the LM6 and brake pressure connectivity, to the slightly softer canopy feel but (still very coherent) of the Aeon with a softer but still responsive brake feel. 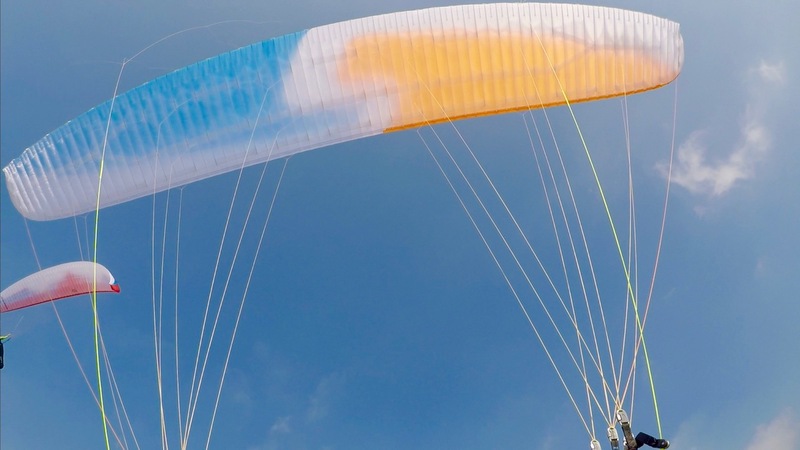 Saying this, i could also feel that in relatively strong air, the Aeon gave me the overall feel of a D glider, as it needed a precise pilot handling which confirm it’s placement in that class. Ears are stable and need pilot input to reopen. Conclusion: Sky has created a comfortable but efficient EN-D glider for the required pilots. Very good climbing behavior, very nice glide at bar. Light weight, and comfortable to fly for pilots flying gliders in the D category.